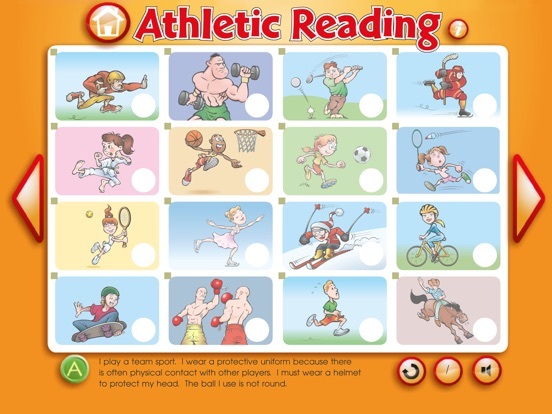 The Athletic Reading game is an educational resource for Grade 5 students. 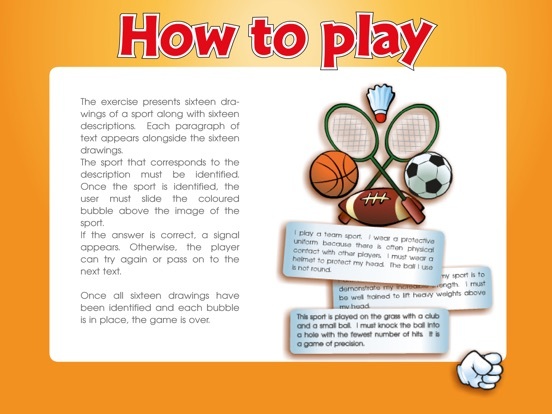 Easy to use, Athletic Reading is created to stimulate children’s reading abilities. The game includes 16 exercises. In each exercise, a description of sport must be associated with the correct drawing. It is possible to move from an exercise to another while saving the answers. The answers are saved until they are all found. Each paragraph of text appears alongside the sixteen drawings. The sport that corresponds to the description must be identified. Once the sport is identified, the user must slide the coloured bubble above the image of the sport. If the answer is correct, a signal appears. Otherwise, the player can try again or pass on to the next text. Once all sixteen drawings have been identified and each bubble is in place, the game is over. © All rights reserved 2015. E-mail: service@envolee.com.